The Prosthetics and Orthotics workshop is providing artificial limbs and supportive aids and appliances either free or on subsidized rates to the needy disabled persons, under ADIP Scheme of the Govt. of India. Workshop division has an integrated set up where disabled persons work hand in hand with their non disabled counter parts. Orthotic appliances. The amputees are being fitted not only with the conventional prosthesis but also with below knee endoskeletal prosthesis, which is comparatively stronger, cosmetically acceptable/quick to fabricate and lighter in weight. The Bachelor of Prosthetics and Orthotics course was commenced in affiliation with the University of Delhi w.e.f. academic year 2004-05 with annual intake of 20 students per year through Common Entrance Examination. The course is approved by the Rehabilitation Council of India. The students are given practical training in fabrication of the aids and appliances for the persons suffering from post polio residual paralysis, amputations, paraplegia, quadriplegia etc. Students are also exposed to training in latest technology in Prosthetics and Orthotics. 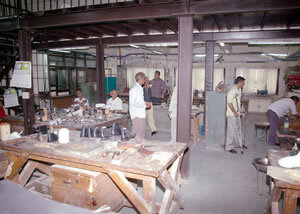 The department organizes various educational programmes in the field of Prosthetics and Orthotics. The department is having an understanding with Maulana Azad Medical College and Netaji Subash Institute of Technology for conduction of medical and technical classes respectively. Apart from this, qualified professionals in different subjects as per the course curriculum are also involved in teaching of students of BPO, as guest faculty. The Department also conducted Condense Course of one year duration in affiliation with JRH University, Chitrakoot, UP to equalize those professionals who have Diploma qualification in P&O with degree holders. A total of 14 students were admitted in the year 2009-10. The course has now been discontinued as it was to be conducted only for 3 years. The Prosthetics & Orthotics department and workshop division are extending the facility of providing sophisticated rehabilitation aids and appliances to persons with disabilities belonging to remote areas through outreach services. The comprehensive rehabilitation camps are organised in poorly covered districts in collaboration with other National Institutes, DDRCs and reputed non-governmental organisations. The support of District Administration is also taken. The tailor-made appliances are fabricated in the workshop within the stipulated time frame. These services are provided at the doorsteps of the disabled persons through camp approach. The camps are conducted under the supervision & guidance of qualified medical and rehabilitation professionals. During the year 2009-2010, Eighteen rehabilitation camps were organised by the headquarter team in different states like Uttar Pradesh, Punjab, Rajasthan, Delhi, Jammu & Kashmir. A total number of 1201 persons have been benefited in these camps. The department is also assisting in the establishment and smooth functioning of Prosthetics & Orthotics departments being operated at various CRCs, DDRCs and SRC. Four of the faculties are sharing the responsibility of being the Incharge District Cell, Officer Incharge CRC Lucknow, Nodal Officer SRC, Secunderabad and Nodal Officer DDRC Jhunjhunu, Rajasathan. The department is generating awareness amongst the person with disabilities. The rehabilitation professionals and personnel of the Institute educated and oriented the persons with disabilities about the utility and care of aids and appliances. They also participate and lead in Rehabilitation Camps, Mela, Trade-Fair and Exhibitions organized by the Ministry of Social Justice & Empowerment, Govt. of India, in urban as well as remote & rural areas. Five faculty members of the Institute completed their graduation in P&O by undergoing the BPO-Condense course organized in PDUIPH, New Delhi being the study centre. The course was affiliated with Jagadguru Rambhadracharya Handicapped University, Chitrakoot, UP. This course has been approved and recognized by Rehabilitation Council of India, New Delhi. The faculty and professionals of the Prosthetics and Orthotics department on the direction of the Ministry are conducting inspections of various NGOs for their technical evaluation for facilitating the release of Grant in Aid to them under the Schemes by the Ministry of Social Justice & Empowerment, Govt. of India. The Institute conducts Inspection / Supervision and Guidance to voluntary organizations in order to facilitate the allocation of financial assistance by the Ministry.